I’m a Miley Cyrus fan. That may seem strange to those who only know of Cyrus’ antics as reported by the media outlets that report sleaze in a quest for clicks and eyeballs. But if you really dig into what she’s doing like I have, you find an artist at the top of her game. 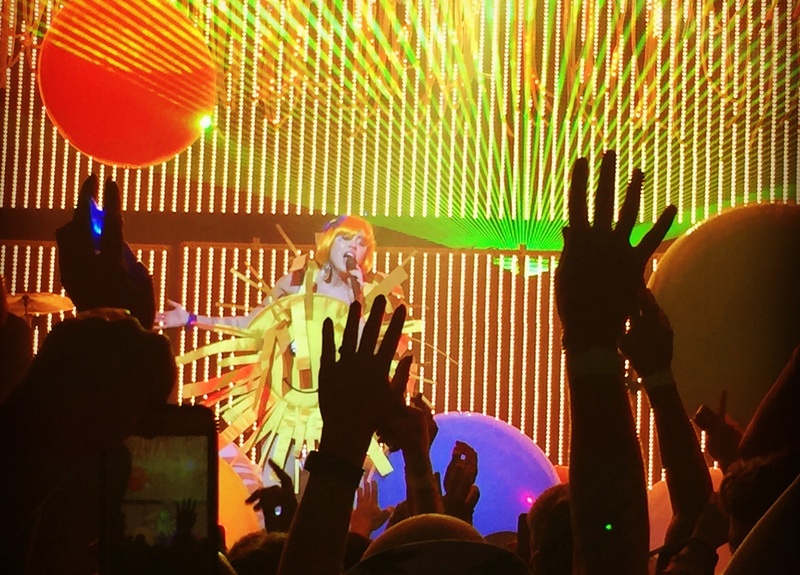 On Sunday I saw Miley Cyrus live for the first time. When I got the Ticketmaster alert I knew instantly I’d be at the show. Miley Cyrus! Backed be The Flaming Lips!! At a club!!! Heck yeah, I'm in. The show at the House of Blues in Boston was trippy, fun, wild, crazy, and really weird. She changed outfits every few songs and we saw her as the sun (in the photo here), the moon, a stick of butter, a disco ball, a bowl of cereal, and, well, let's just say a few others. When I mention that I appreciate what Miley Cyrus is doing, none of my friends take me seriously… at first. But it’s not just me who has positive views of her. Recently Elton John called Cyrus "brilliant" and says she’s doing what Frank Zappa would do in the 1960s. Editorial note: I saw Zappa live on Halloween night 1978 at the New York Palladium and I’d have to agree with Sir Elton. Here are a few observations on what Miley Cyrus is doing. Many of these can be applied to your business too. At the show I was likely the oldest person in the room. Nearly everyone was late teens or early 20s and it skewed strongly female. (Bonus! There was no line at the bar.) While I was waiting for the show to start, I chatted with several young women who told me they were fans of Hannah Montana - the Disney show that Cyrus starred in from 2006 to 2011 - in middle school and had been following Miley Cyrus since. Cyrus knows that her original fans have gown up with her and she’s focused on bringing them along on her journey as she grows up to find her post-Disney voice. Hannah Montana was Disney. As Cyrus moved on, her challenge was to break out of the Disney world and become an artist in her own right. While she certainly has a world-class voice (check out her cover of Paul Simon’s 50 Ways to Leave Your Lover) that alone doesn’t mean she can attract an audience. Much of what she’s done in recent years - from collaborations with artists like The Flaming Lips, to forays into bisexuality, to establishing her Happy Hippy Foundation whose mission is to rally young people to fight injustice facing homeless youth, LGBTQ youth and other vulnerable populations, to her unapologetic and vocal love of smoking pot - has been unique and helped develop her public persona. Cyrus knows that people love an artist who is authentic and original. Cyrus shocked the music world as well as her fans when she dropped a surprise album recorded with the Flaming Lips Miley Cyrus & Her Dead Petz and made it available for free. The album is quite good in many places, especially the opening song Dooo It! (video here lyrics NSFW). Miley Cyrus & Her Dead Petz is a strange psychedelic album unlike anything Cyrus has done before. She knows that by creating content and making it free you attract attention and generate new fans. Her @MileyCyrus Twitter feed (with 24.4 million followers) and especially her very active @MileyCyrus Instagram (32.3 million followers) are the primary way she communicates with fans. Cyrus knows that connecting directly with her audience in real-time via social media keeps her relevant. Like me, Miley Cyrus has a unique name on the Web and therefore has owns her search engine results from the start. Yet most companies choose names that are in some way generic, which dooms them to a life of continualy low search engine rankings.